The Womack Law Firm provides legal counsel and litigation services to a diverse clientele, from individuals and small businesses to Fortune 500 companies. While much of our work is in Houston and Harris County, we are regularly hired by clients in Dallas, the Panhandle, statewide Texas and beyond. Attorney Mark T. Womack offers 30-plus years of problem-solving and litigating experience. His law practice spans business and commercial litigation, employment disputes, real estate litigation, securities fraud and tax controversies. Mr. Womack is an accomplished trial and appellate lawyer who is rated AV Preeminent* through Martindale-Hubbell. His notable results include a landmark verdict in the largest title insurance fraud case in U.S. history. 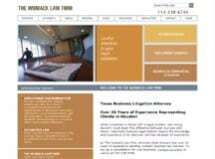 The Womack Law Firm is known for results in complex business and commercial litigation, including breach of contract, partnership disputes, business torts, intellectual property disputes, title insurance litigation in commercial real estate deals, and industry-specific conflicts such as construction litigation. We counsel owners, investors, executives and directors of companies, and we represent individuals in contract, real property and investment disputes. Arrange a confidential consultation with a Houston attorney to discuss how your interests should be protected and your situation may be most favorably resolved.